of mine because I love it’s rich and welcoming atmosphere. Kerry will always greet you with a big radiant smile and Gerda will inevitably offer you a delicious selection of ales. If you’re lucky then pan fried spiced fish cake with spinach, cockle and lemon mint cream will make an appearance on the menu. Simon Cadge and his partner Gerda Koedijk have been running The Pheasant since January 2012, with John Hoskins (whose family have been involved for 50 years) providing support. Great food, a genuinely warm welcome, real ales, an award-winning wine list, log fires and a herb garden. Everything you would hope for in one of the best country inns. Just the other day I tucked into the quintessential full English breakfast. Homemade scones with jams and clotted cream for afternoon teas, and in those cold winter days you will find the wood burner brightly burning while sat enjoying homemade carrot and coriander soup. All using vintage china teacups and with views across open countryside from the pretty gardens. Woohoo!!!! We've done it again.We are named 'Cambridgeshire Dining pub of the Year 2019' (Good Pub Guide).We are all so excited and like to thank all our customer for saying nice things about us. Also a BIG thank you to our fantastic team, as without all your hard work, this wouldn't be possible. THANK YOU ALL! The good bean cafe brings you freshly ground coffee and much more. When you visit, Bridget will go through her “talking menu”; this she does every day, keeping her on her toes as the freshly made produce means that the choices on offer change almost every day in this friendly cafe. 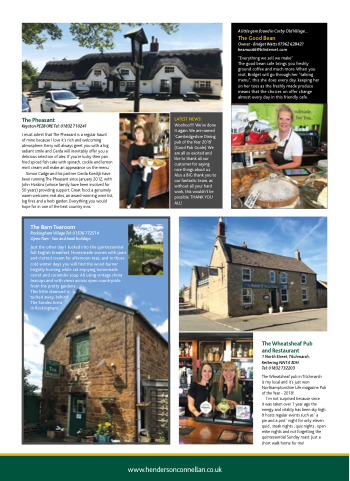 is my local and it’s just won Northamptonshire Life magazine Pub of the Year - 2018! pie and a pint ‘ night for only eleven quid , steak nights , quiz nights , open mike nights and not forgetting the quintessential Sunday roast. Just a short walk home for me!